The world is screwing itself! I think we are in the middle of an unfolding horror story! For, it can’t be a bizarre coincidence that when we are at the peaks of technological innovation, USA is going through its worst recession in 97 years. The story is not too different in Europe and most of the rest of the world; there must be something seriously wrong somewhere. I have no hesitation in saying that the world is on the verge of screwing itself in a spectacular fashion! As a kid I used to imagine a future where robots would do things for us. Surprisingly that day has arrived but these robots don't look like anything I imagined as a kid. They don’t have arms or legs but instead have attained the form of computers and smartphones with the Internet acting as their brains. The talk about machines replacing humans is an age old story and we have managed pretty well so far, but this time things are different for two reasons - Distribution and Convergence! Earlier too machines replaced jobs but they never had this ability to multiply and spread across with almost zero additional cost through the Internet. Take the case of the postman vs email or traditional books vs Kindle books, it costs next to nothing to distribute something that used to take time and effort in the past. Time and effort that was spent by real people doing real jobs, not needed anymore. For more such examples of jobs that are going obsolete you need to check this article. It mentions some interesting jobs right from bank clerks to ticketing attendants, etc who are all going extinct - A look at jobs replaced by technology. Where do all these people go now? In the battle between man and machine there is an age old argument that says instead of a candle we now have a light bulb and in place of a horse carriage we have a car, so disruption is good. But now we are faced with a new problem – Convergence. Due to convergence of technologies, multiple tasks are now doable with a single device. The smartphone and tablet are effectively destroying the calculator, camera, torchlight, alarm clock, wrist watch, notepad, audio player and multiple other industries, I am not even talking about the things one can do via the internet - the scale of disruption is unimaginable. All these existed earlier as separate entities with real people working on making those products. They are now not needed anymore, forget job loss, those products themselves won't exist anymore. And who manufactures these new converged products? Most probably some company like Foxconn in China where Apple and many other companies build their products at dead cheap rates. None of those manufacturing jobs are going back to USA or anyplace in Europe. No wonder the Eurozone is in tatters right now, Greece is at 60% and Spain has 55% of its youth between the ages of 18 and 25 unemployed right now; forget manufacturing, they might never even get a job that involves soft skills, all thanks to outsourcing. Outsourcing, while taking away jobs from many, has provided employment to millions on the other side of the globe. This led to an increase in earning potential as well as spending capacity for millions who could now aspire for things that were unimaginable earlier. New doors opened where none existed earlier. However, there are dangerous pitfalls on this side too. There are two main patterns one can notice – Obsolescence and Cannibalism. All the points that I mentioned as the pitfalls of disruptive technology apply here too. You can never say when a particular piece of technology or service will go obsolete. The skills that we learn today might not be needed tomorrow; this applies to software professional that are dime a dozen out there specializing in skills that could belong to the Jurassic era tomorrow. Very few people specialize in real skills anymore, right from a commerce graduate to a science student to a mechanical, civil or chemical engineer; all want to become Software-IT Professionals or at worst - Call Centre Executives. That is where the easy moolah is. The rest who continue in the pursuit of conventional professions find themselves in a unique fix, not able to compete with their counterparts in the IT industry in terms of fat pay cheques. But there is an even bigger issue in play here - Cannibalism. In the modern world of outsourcing, cannibalism is a rampart practice. Wait, don’t worry, no one is eating anyone else alive but everyone is eating away everyone else’s jobs. Organisations are always looking at doing things the fastest and the cheapest way. They achieve it by employing smarter technology but where manpower is essential they are always on the lookout for a cheaper option that can accomplish the same task in a much quicker time - the primary reason why outsourcing exists in the first place. Why hire an experienced hand when a trainee will suffice? For a country like India, that boasts of a massive youth population that is ready to be employed. The future can be quite unsettling. It is a win-win situation for the bosses, but can't say the same for the employees as the term job security does not exist in their dictionary anymore. Worst part, in the modern age there are no worker's unions to protect you, they are all dead, and each man is unto his own. The best you can do is change your profile picture on Facebook as a sign of protest like how some of my friends from the VFX industry did after ‘Rhythm and Hues’ won the Oscar for best VFX this year in the backdrop of imminent bankruptcy. The west is screwed and the rest is screwing itself! James Altucher, one of the exciting writers I came across online recently, wrote a post called 10 reasons why 2013 will be the year you quit your job - he says, turn into an entrepreneur to save yourself. He makes some terrific points to support his case, but I wonder, how can everyone become an entrepreneur? Someone has to be at the bottom of the chain and even if someone dares to do something on his own, the big daddies will give them sleepless nights. Also in an open economy where everyone has equal opportunities, it is the biggies that still get the maximum eyeballs. The rest is just a crowd. Take the case of movies. The top hits today make more money than ever while the bottom is a horror story with many movies not even finding a decent release; it is a problem of plenty. It is the same with businesses and start ups. The big daddies capture the bulk of the market and the smaller fish are in the game only to be hooked or to be eaten by the biggies. No wonder income inequalities are growing wider world wide between the rich and the others. Rich become richer and the poor become poorer has never been truer than it is today! Forget poor countries where wealth inequality is extraordinary and the bottom of the pyramid is unimaginably huge. Instead take the case of America which in everyone's opinion is an advanced and wealthy nation. Truth is, top 1% of America’s rich control 40% of their nation’s wealth. You should check the video below to see the scale of this phenomenon. It is scarier than you can imagine.The middle class is almost non-existent now. We could as well rename it the temporary class because you could land up on either end of the pyramid depending on how long you can afford to hold on to your jobs to pay your EMIs. We aspire to reach the top, but in reality most of us are just a part of the vast bottom that is feeding the top! How do we survive in a world where our worth is only determined by our last pay cheque? How in the hell did we end up here? I wonder too. It is time you wondered too. Until then, we shall continue to be willing and invisible participants in the mission to screw ourselves and our world. We have done a terribly great job of it until now. It is high time we figured out newer ways of living and surviving in this world that is not dependent on us working our asses off. I hope Google has some ideas for that too. Maybe you have one. Let me know. 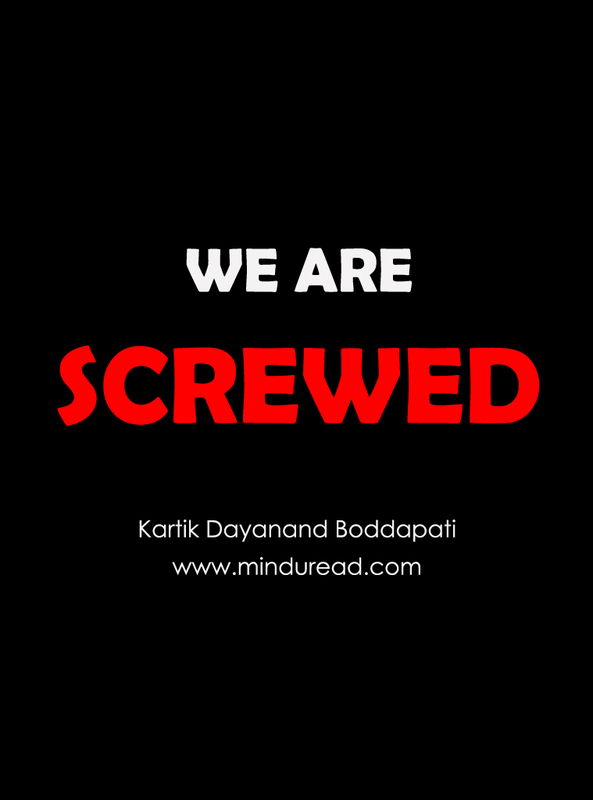 Update (17th May 2013): This post has been republished on the popular site Dangerous Minds by the name WE’RE SCREWED: HOW WILL WE SURVIVE IN A FUTURE WITHOUT JOBS? Head there for some additional insightful user comments!